The “heavy duty” member of the Premier family, the RR Type 1 is specifically designed to handle wide or heavy loads. All RR Type 1 machines are painted with two coats of zinc primer and a 2 pack epoxy acrylic top coat as standard. Each RR Type 1 pallet inverter model is built to customer requirements but usually with dual clamps and a load capacity of anything up to 10,000 Kgs. The particular style of pallet inversion makes the unit the obvious choice for loads such as steel or board over 2 metres in width. We always recommend automated controls with the RR Type 1. The touch of one button initiates a clamp, recline and rotate sequence. The machine would have a fixed location where it would be surrounded by fixed guards and photo-electric beams. The RR works on a totally different principle to the other styles of 180 degree inverters, the letters in its title standing for “recline and rotate”. 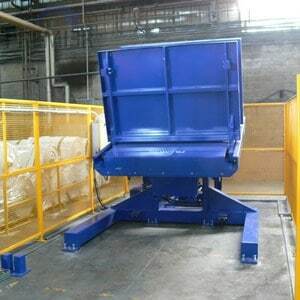 This method of tipping the load through 90 degrees onto its back so that it is centralised over a turntable is an ideal one when handling very wide or heavy loads. It can be built with single or dual clamping tables to any width or depth. The jaw opening is also totally variable, though normally the loads it has to handle are not that high. 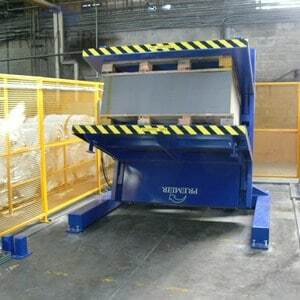 Typical applications would be to invert stacks of steel through 180 degrees after stamping or surface treatment, to turn piles of laminated boards to meet customer requirements or to handle mould-manufactured concrete products. The RR Type 1 is almost always supplied as a fully automated and guarded system custom-built to suit the individual user’s needs. Premier has built machines with up to 10,000 kgs capacity and could go higher than this if the need arose. 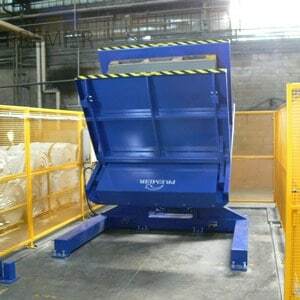 It is certainly a machine which is aimed more at load inversion than as a method of pallet exchange, but with wide or overweight loads there is no better method of handling.